THE CITY of London will get ten new water battle refill points over the next two years in a bid to drive down the use of plastic bottles. The exact locations of the new refill points will be decided after a public consultation but the City of London Corporation wants to place them in parks, retail squares and near transport hubs. Two of the new water refill points will be located in the recently-completed Aldgate Square development. The initiative form part of a wider campaign to create a network of places to fill up your water bottle in pubs, restaurants, bars and cafes across the Square Mile. People can already access water to fill up their bottles at fountains located in Carter Lane, Cheapside, Monument, Festival Gardens, Middlesex Street, and at the St Lawrence Jewry Memorial Fountain. “The impact of plastic bottles on the environment is clear and it is time for us to play our part. A colourful parade on the river Thames which harked back to a bygone age has been dropped from this year’s Lord Mayor’s Show. In recent years the Lord Mayor’s Day river flotilla has seen the new mayor start his big day with a trip down the Thames on board the Queen’s row barge Gloriana. Gloriana was accompanied by the traditional cutters of the Traditional Thames Rowing Association (TTRA) in a revival of an ancient tradition. But the TTRA and organisation that manages Gloriana have been told they they will not be required for this year’s Lord Mayor’s Show which takes place each November. Some of the City’s historic buildings are to be complemented by remotely operated lighting with different colours at different times of the day, the City of London Corporation has announced. The plans form part of the new Smart City Lighting Strategy which will also improve energy use and help tackle light pollution. Urban spaces will be “coated in various lighting types, levels and colours at different times during the night” in the scheme which will complement the roll out of energy-saving LED lights in the Square Mile. 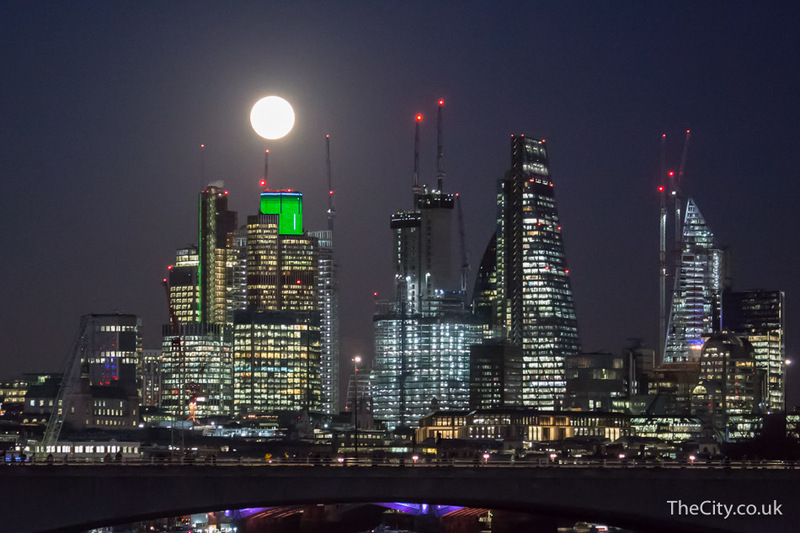 Chris Hayward, Chairman of the City of London Corporation Planning and Transportation Committee commented: “The City Lighting Strategy will improve the quality of life for the Square Mile’s workers, residents and visitors, and tackle the problems of light pollution. We want our streets to be safer, more sustainable and more inviting. Poor street lighting is a constant issue for London and it is time to change that. 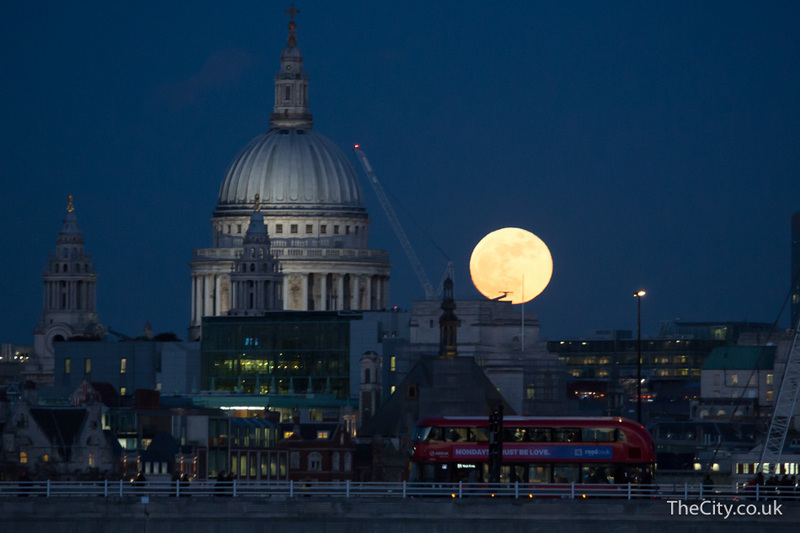 A BEAUTIFUL supermoon was pictured rising above the City of London earlier this week. 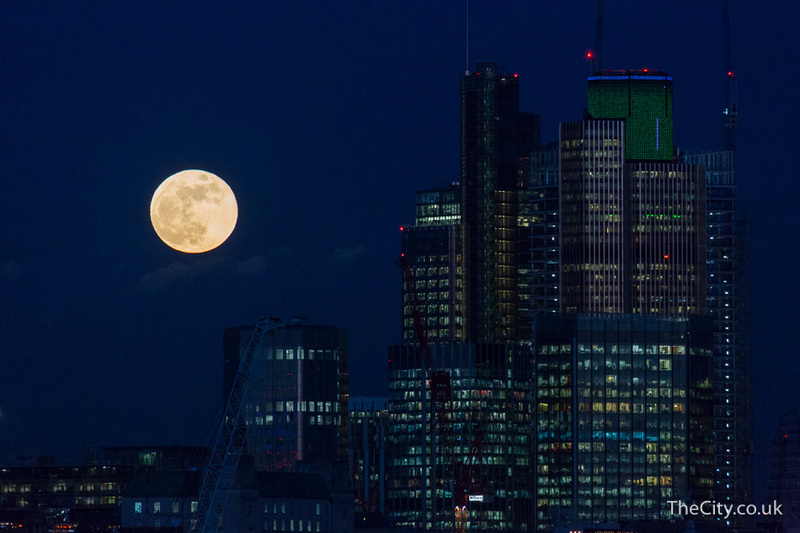 The awe-inspiring sight took place on Wednesday afternoon when the full moon ascended into view with many onlookers choosing vantage points which saw it appear above the Square Mile. The second full moon in the month of January – making it a blood moon – was also what’s called a supermoon because it appears marginally larger due to it coinciding with its closest approach to our planet. 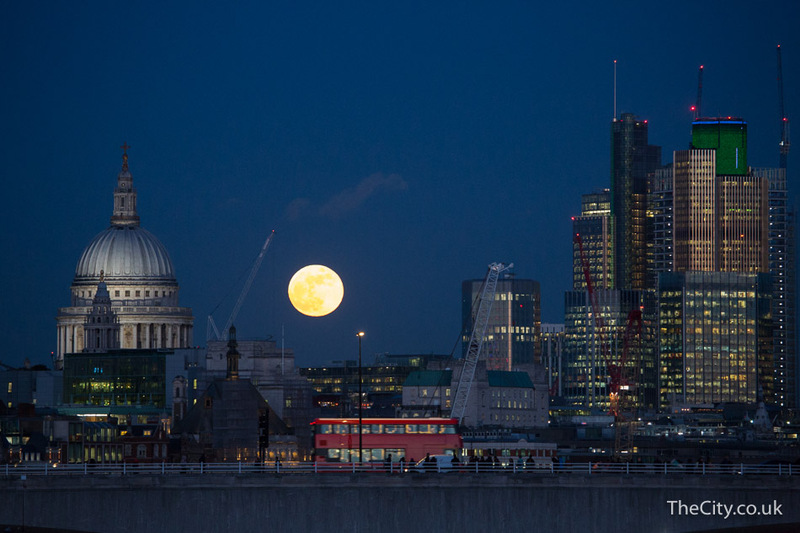 Taking on a yellow hue as it came into view, the moon was seen by those watching in the right spots to rise close to St Paul’s Cathedral before arcing over the familiar outline of the City of London’s skyscrapers such as Tower 42 and the Leadenhall Building. These pictures can be republished elsewhere online for free if accompanied with a hyperlink to https://thecity.co.uk. 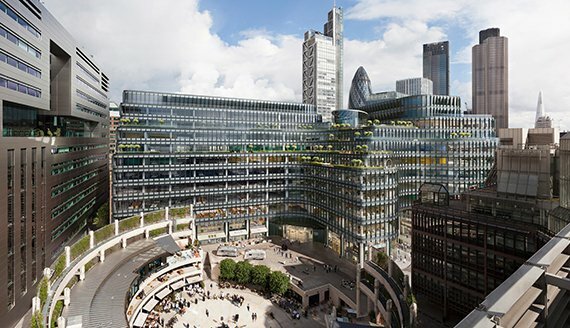 BLOOMBERG’s new European headquarters have been unveiled in the City of London, bringing 4,000 London staff under one roof for the same time. 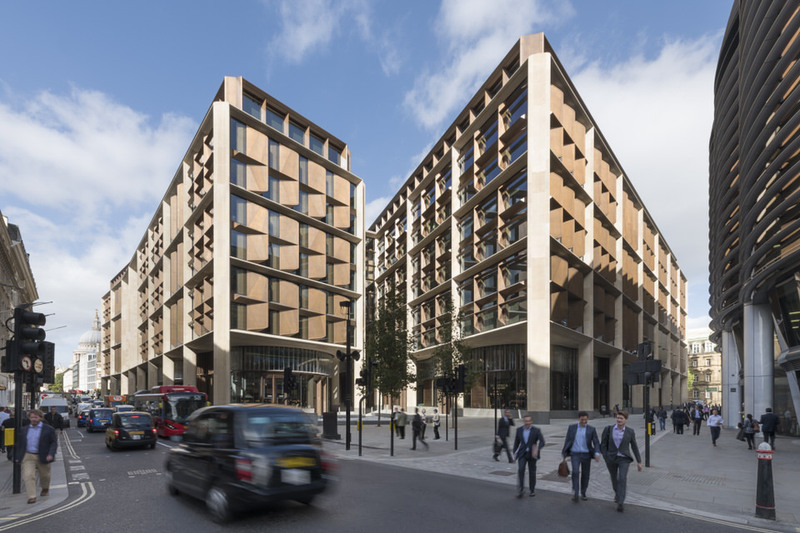 The impressive new offices, designed by Lord Foster, have taken the best part of a decade to bring to fruition and are the first offices in the world to be wholly owned and created by Bloomberg. Founder Mike Bloomberg attended the official unveiling this week along with Mayor of London Saqiq Khan. Bloomberg’s 3.2 acre site is in Queen Victoria Street, just off Cannon Street, and features new public plazas including the Bloomberg Arcade which divides the development in two and is home to new restaurants with an international flavour. 9.5 million man hours has gone in to the development which has used 9,600 tonnes of Derbyshire sandstone. Replacing the former 1950s office building Bucklesbury House, the new Bloomberg offices have been built over an important Roman archaeological site – the ancient Temple of Mithras – which is being reconstructed and put on display in a new public space from next month. THE Walkie Talkie skyscraper in Fenchurch Street has been bought by a Hong Kong based company for a record breaking price. £1.3 billion is the price that’s been agreed between joint developers Landsec and Canary Wharf Group and buyer LKK Health Products Group Limited – the largest amount ever paid for a single building in the United Kingdom. Officially known as 20 Fenchurch Street, the landmark building with a distinctive top heavy profile was designed by Rafael Viñoly. It was anything but a smooth beginning for the unmissable skyscraper – it made headlines around the world when sun-rays reflecting from the building melted part of a car at street level and in 2015 it was awarded the Carbuncle Cup which singles out ugly new buildings. ONE of the City of London’s most iconic skyscrapers has been sold for £1.15 billion. Developers British Land and Oxford Properties have agreed the sale of the Leadenhall Building to Hong Kong-based C C Land. The Rogers Stirk Harbour + Partners-designed building in Leadenhall Street, which has a distinctive sloping appearance, was completed in 2014 and is the second tallest building in the Square Mile. Contracts have been exchanged on the purchase of the 46-storey tower but the deal is subject to final approval by C C Land shareholders.